A silk faux finish isn't complicated to apply, but it does take time — 3 days' worth, in fact! To create a successful silk faux finish, you'll need one day for the base coat and 2 days for the faux finish itself. In the end, all that time will be worth it, as you'll have a beautiful, shimmering wall, that mimics the sheen and luster of precious silk fabric. 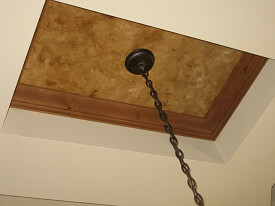 A silk faux finish is known for giving walls (or ceilings) great depth and shine. There is a wide variety of color options, but keep in mind that a silk faux finish works best when using similar base and glaze colors. So if you are looking to create a subtle contrast on your walls, then a silk faux finish is for you. The secret to this look is the metallic glaze that is used together with untinted glaze. This combination is what creates the natural sheen and shimmer of silk. It's a great way to warm up a den, study, library or even a dining room. 1. Choose a base coat paint. Then find a metallic glaze to go with it. 2. Get all your supplies ready. 3. Do your painting prep work: tape, remove hardware, etc. 4. Paint the first coat of base paint and let it dry completely. 5. Paint the second coat and let dry thoroughly. 6. Mix enough paint and glaze to cover the entire surface in a large container. Using a ratio of 2 parts glaze to 1 part paint, blend together with a stirring stick or a paint mixer and drill. 7. Make one large paint stripe down the wall and immediately run a wallpaper brush over the stripe. Wipe the bristles off with a lint-free cloth by the next run. 8. Continue to roll the paint on the wall in the same manner, working in small sections at a time. Apply the metallic glaze after each stripe of paint is applied. Wipe the wallpaper brush after each run down the wall. 9. Let dry, and enjoy your gorgeous new room! Don't have the time -- or patience -- to create a silk faux finish yourself? Find a local, professional and reliable painter.